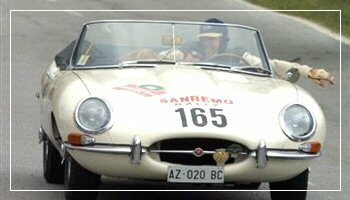 San Remo Historical Rally is held in April and is a special opportunity to see historical antique cars on parade. The competition is open to 5 categories of cars: cars registered between 1919 and 1930 belong to category C; cars registered between 1931 and 1946 belong to category D; cars registered between 1947 and 1960 belong to category E; cars registered between 1961 and 1965 belong to category F; and cars registered between 1966 and 1971 belong to category G.
The first Historical Rally took place in 1928 and at that time its participants were mainly top members of the industrial world and the fashionable society. Since then professional drivers have taken part to the rally thus turning it into a more professional competition. The car parade is undoubtedly a prestigious event during which historical cars race along a 270-km-long course. The route is divided into 2 legs with 11 special stages for about 92 km. To enhance the competitive character of the Historical Rally, its organisers have had its validity recognized as a round of the European and Italian Historical Car Championship. To compete in this event, you must have a FIA or CSAI competitors licence.